A few weeks and 580 miles ago a particularly attractive 5 year old small Volvo was bought from a used car dealership. In Ice White with Anthracite alloys it must have had many an admirer whilst sitting there. However, the owner soon became concerned about a ‘clonking’ from the suspension/steering and called us in to help. As it happened two members of staff were in town that day so we were two up as we drove down the Exit ramp at Festival Place Shopping Centre. Half a mile later we’d chickened out of driving it any further and were busy tightening 19 wheel nuts on the roadside, the 20th having already departed! You might be thinking it was a disturbed theft attempt, but no, it was far more obscure and sinister than that… We put the car on a wheels free ramp and confirmed our suspicions. Heavy paint build-up on the wheel nut seats during the recent sales preparations (refurbish + colour change to Anthracite) had been ignored and this had oozed out over the 580 miles (see photo), allowing all the nuts to become slack and start falling off. Wheels would have swiftly followed. We checked for hub and wheel damage, cleaned the nut seats, replaced the lost one and are happy to report that car and owner are alive and well. The lesson to be learnt here is that refurbished wheels may look pretty but are still potentially death parts. And always check your nuts! N.B. Following a repaint, remember that the back mating faces must also be free of paint build-up or exactly the same thing will occur – wheels will detach. 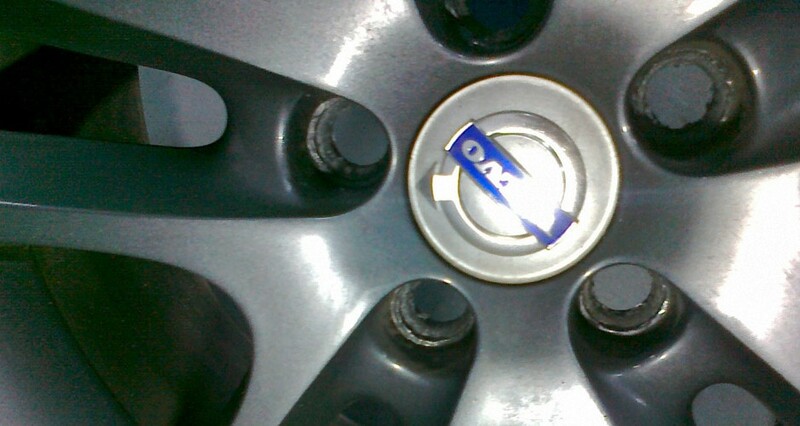 Always check wheel nuts thoroughly several times after any form of wheel reconditioning.